The Cosmopolitan Blog Awards have been the highlight of this year and week for me and it still feels so surreal that I was awarded Highly Commended for Best For Food. I am very very happy though. After the event, I had one hour of sleep, jumped into a cab with Amit at an ungodly 4:30 am and turned up at Heathrow terminal 3 ready to go on vacation. We ate breakfast, drank lots of coffee, did some duty free shopping (I bought Burberry Body it smells so good and a book), and settled down on a British Airways flight. We arrived in Vienna a few hours later and my home for the next few days is the stunning Le Meridien Wien, in a central location and with a lot of grandeur. The hotel has a lot of interior heaven and an amazing Unlock Art exhibition at the moment so there is plenty of trendy art all over the hotel. As soon as we checked in we napped out of utter exhaustion and boy was the bed comfy! The highlight of the room though is the bathroom as it has this beautiful pink tub. JUST LOOK AT THAT! I have already warned Amit that we are bath tub shopping when I am back. I am now very pleased I packed a lush bath bomb in my bag as I intend to spend some “me-time” in that tub! After a power nap, we freshened up and decided to explore the hotel and our surroundings. When you look like you have had very little sleep, this Becca Shimmering Skin Perfector is a god send. It woke up my skin and transformed it from tired to fresh and dewy. I wore it under my tinted moisturizer. The hotel is really cool. They have this massive lips piece in the lift lobby. They also have an in-house Moet Bar and restaurant. I decided to treat myself to an apple strudel eclair and boy was this good! We then grabbed an umbrella and decided to brave the rain and wander outside. 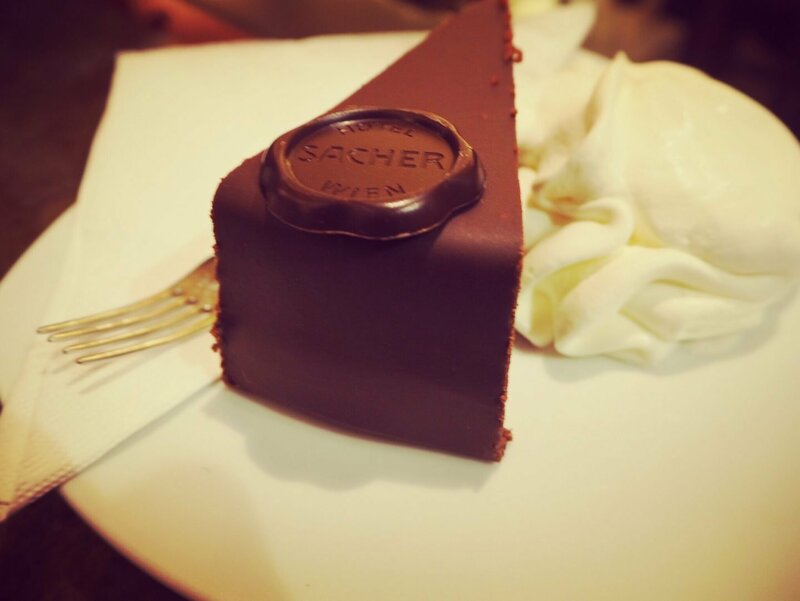 The hotel is in close proximity to shops, museums, restaurants and bars and we stumbled across Hotel Sacher, the Vienna branch, and home to the famous Sacher Torte. While we queued up in the trendy cafe for a table we ogled at the different cakes on display. We didn’t have to wait long and got a cute corner table where we could people watch and indulge. 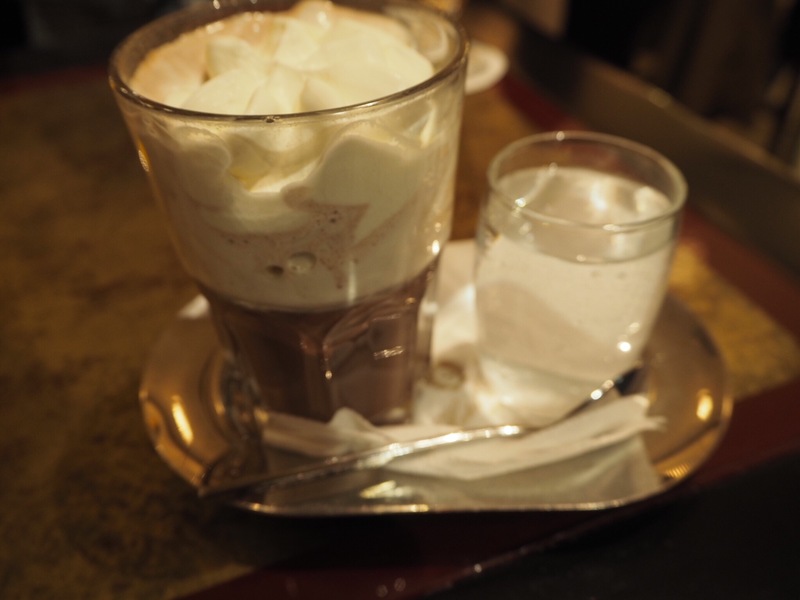 To warm up with I started with a Viennese coffee with lots of whipped cream. I went for the Sacher Torte of course and it exceeded my expectations totally. I have a feeling I will be eating some more during this trip. Amit went for the Apple Strudel with ice cream and this was so delicious too. After indulging we walked around snapping photos of the hotel exterior and walked about. We came across this really cute street which had lots of wooden pop-ups with food, drinks and gifts. It was very festive and lots of nice foodie treats. We were so full from the cafe so we just browsed. I was so tired though from the run up to the awards and the journey so we headed back to the hotel, planned what we were going to do the next day as both of us had been so busy prior to the trip we hadn’t had a chance. I am ashamed to say I didn’t make it out for dinner and instead snuggled into bed with chips from room service. If you had tasted these chips you would understood. THEY WERE INSANELY GOOD! My first impression of Vienna is it is beautiful, with lots of historical charm, amazing architecture, beautiful streets all beckoning to explore and is a very cosmopolitan city. I’ve put Vienna on my bucket list. Can’t wait to see the next few posts. Hope you’re having fun! And I don’t know how you managed to put up a post when you’re that tired. Okay, bye. Off to raid the kitchen!